Sultra the Vixen is a combination curling iron, hot air brush and dryer all in one sleek and beautiful volumizing package. While some other hot air brushes need to be used on slightly damp hair, or require product on dry hair, the Vixen uses hot air to heat the ceramic barrel. This creates a combination of hot air brush and curling iron that can be used on dry or damp hair. Instead of spending over an hour sectioning, blow drying, and curling your hair, you can achieve a beautiful blowout look with curls and waves with one piece of equipment. It leaves you with more time in the morning to sleep in since you won’t have to spend an hour doing your hair. When it comes to a beauty product that allows more beauty sleep, we’re all about that. If you have hair that is showing signs of heat damage, you should be careful about further damaging your hair with equipment that will burn. The Vixen has two heat settings to give your hair a break when it has had enough excessive heat. Along with a lower heat setting, the Vixen’s ceramic barrel means that it works with ion technology to dry your hair quicker. This means less time with direct heat on the strands of hair. 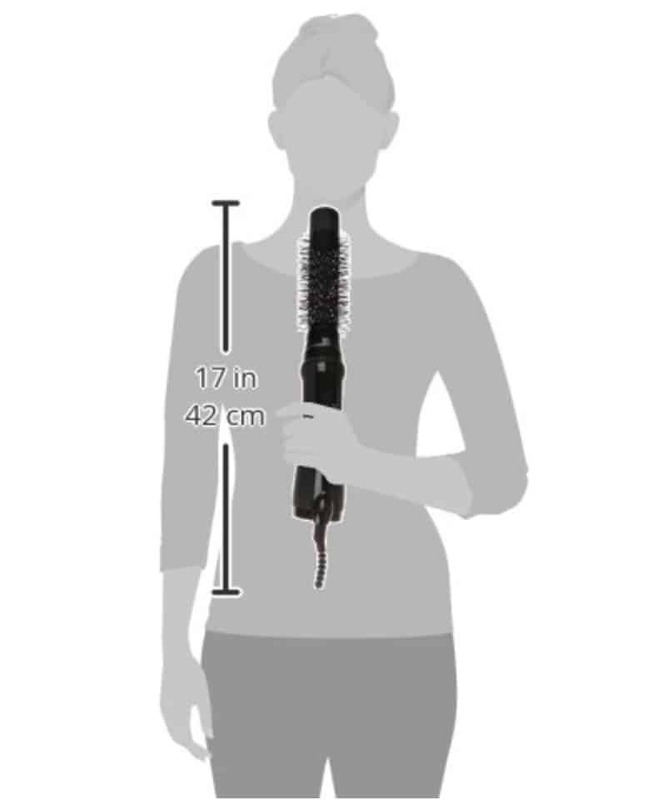 The hot air drying brush is perfect for thin, fine hair that requires a good volumizing brush. When this brush is used close to the scalp, it creates a beautiful lift that stays in place throughout the day. Combine the drying brush with a volumizing spray or mousse for extra lift. You’ll find yourself with bouncy hair that looks like you went to a salon. 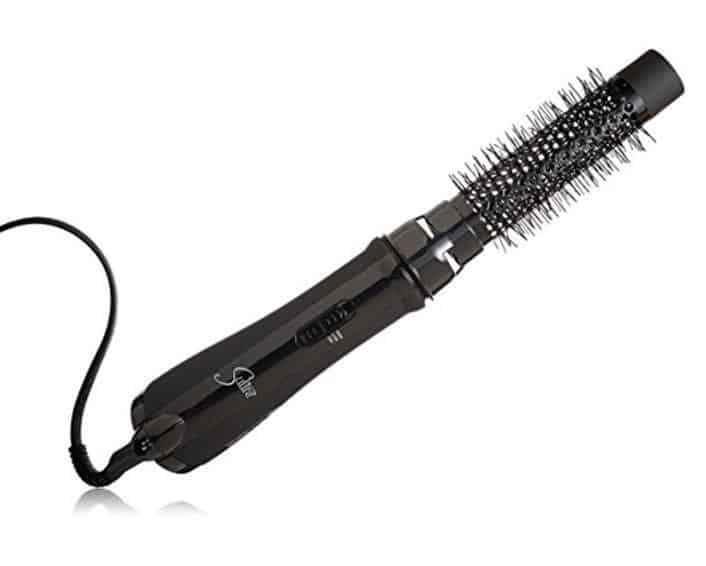 With the 1000-watt powerful blow drying, thick hair will dry much quicker with this brush. It helps to do a rough blow dry before using the styling brush, but once you use the brush, it’ll be much faster and create thick, shiny style. One of the hardest things about having coarse hair is that it never looks smooth and shiny enough. The ceramic ion producing barrel will smooth the hair as if you were at a salon without the price tag. Nobody has time or money to go to the salon every day to achieve the best look possible. It’s not necessary with the Vixen. While some brushes spin, the Vixen is a bit different. Instead of swivelling, it allows you to grip the hair between the bristles and smooth is before curling the ends around the barrel. While it’s blowing hot air to dry quickly, it’s also curling at the same time. This creates a smooth texture that requires less product and heat time. Section hair to keep pieces of hair out of the way while you’re curling one section. While it won’t ruin your hair to redo parts of other sections, it wastes time when you can just curl large parts quickly and easily. When sectioning, choose enough hair to fill the width of the barrel. Brush the hair from the scalp down to the end before rolling their hair onto the barrel like you would with a regular curling iron. The bristles will keep the hair on the barrel itself. Once the hair is completely wrapped, allow it to sit for a minute or two. This technique will give you big, loose waves. If you’d like to wave just the ends of your hair, you can dry your hair using the brush without curling the hair around the bristles. Brush through the hair to the end then wrap an inch or two around the barrel by twisting the strands at the end. You can play around and experiment with techniques that work for your hair and the styles you want to design. Sultra the Vixen Hot Air Volumizing Dryer Brush can be used on all different hair types and lengths. Whether you have fine or coarse hair, you’ll be able to create volume and produce shiny, smooth styles that will look like you’ve been to a salon. Along with being a great product for your hair by providing three different pieces of styling equipment in one, the Vixen is just a fantastic name for a brush that gives you stunningly gorgeous hair!